Sphere, cube or any other shape? Made for musical events or congresses! With its eye cat­ching pro­fi­le the aiR­do­me com­bi­nes a clas­sic sha­pe with the high re­qui­re­ments of mo­dern event tech­no­lo­gy. 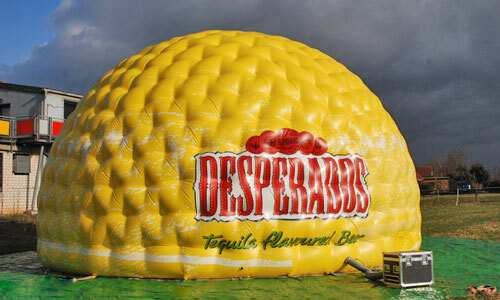 A short se­t­up ti­me and small trans­port vo­lu­me go ea­sy on your bud­get, en­ab­ling you to fo­cus on your event. aiR­blox is an in­fla­ta­b­le room sys­tem de­sig­ned en­t­i­re­ly for the pur­po­se of crea­ting mo­bi­le com­mu­ni­ca­ti­on areas. Tra­de shows, Cor­po­ra­te Events and Con­fe­ren­ces are the main ap­p­li­ca­ti­ons for this tent. The air-sup­por­ted struc­tu­re of the me­dia do­me enab­les vir­tual-rea­li­ty pro­jec­ti­ons of the hig­hest fi­de­li­ty. The do­me has be­en opti­mi­zed for high mo­bi­li­ty, short se­t­up and di­sas­sem­b­le ti­mes, small pa­c­ka­ging si­ze, low weight and ea­se of use. The full­b­lown full­Do­me theat­re can be se­t­up wi­t­hout the need for tech­ni­cal aids li­ke cra­nes or ele­va­ting plat­forms and in­de­pen­dent­ly from wea­ther con­di­ti­ons. The aiRdome tents are made for out- and indoor trade shows. The short setup time of the inflatable tents enables you to concentrate on the essentials. Due to the double walled construction of the dome tent it's very energy- and cost-efficient to heat or air-condition the domes. The high quality silent blowers allow for applications even in noise-sensitive areas. Its futuristic design creates a unique point of interest directing visitors flow to your event location. The high and light-flooded cupola of the promotion tent creates a pleasant atmosphere — enhancing your presentation and increasing the average time visitors spent. 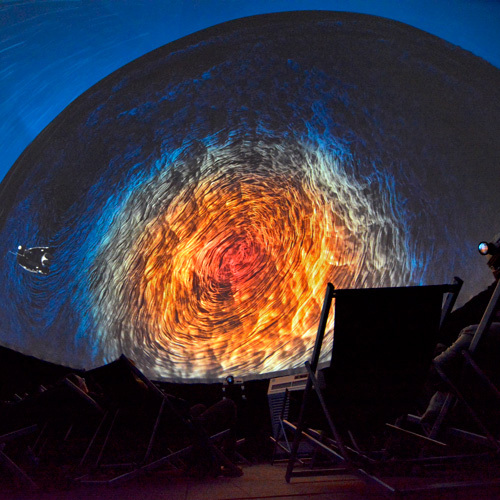 See the first mobile immersive cupola-based projection enviroment in action — the fullDome by tat aiRstructures. 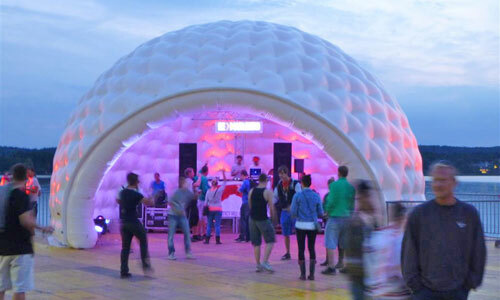 The air supported structure of the media dome is based on the time proofen aiRdome concept. 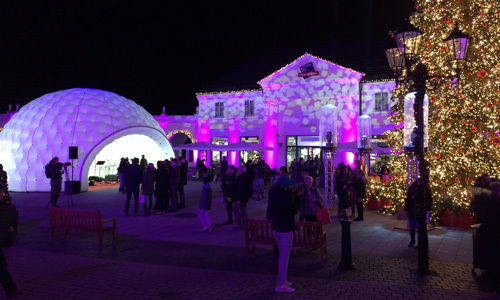 It enables an unmatched mobile fullDome experience — for trade- and roadshows, mobile planetaria and other temporary installations. 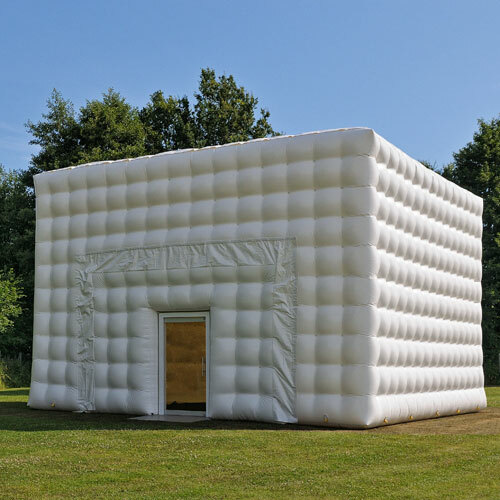 aiRblox is an inflatable tent system focusing on creating mobile space for Corporate Events, Trade Shows, Fairs and Fora. aiRblox – the Location. For Trade-Shows, Trainings, Fora. The inflatable aiRdome tents are jack-of-all-trades. Event-Tent, Promotion-Tent, Chill-out-Lounge, VIP-Area, DJ-Tent, Fair-Tent - the possible applications are only limited by your imagination. The double-walled construction and the alveolated surface structure create a pleasant atmosphere. 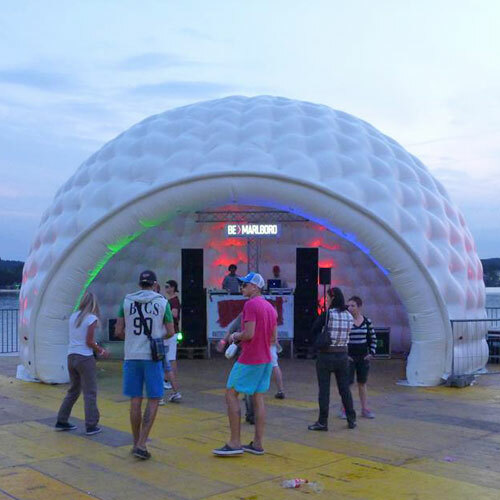 By removing the sealing hull of the aiRdome you can create a wide open space. 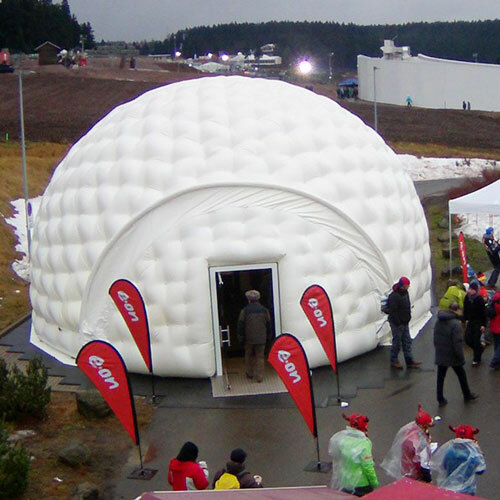 With or without windows, single colored or digitally printed with your branding, in standard sizes and even in custom shapes - no other tent system is as flexible in its applications as the aiRdome.